This dress is made from French silk with silver beading detail across the bust. It was custom made, with every aspect prepared by hand. It is white in colour with blush undertones. It has a really flattering mermaid shape which hugs all your curves before flaring out with a short train. The finger loops make it super easy to dance in! There are built in cups (a B cup) so you don't need to wear a bra with it. 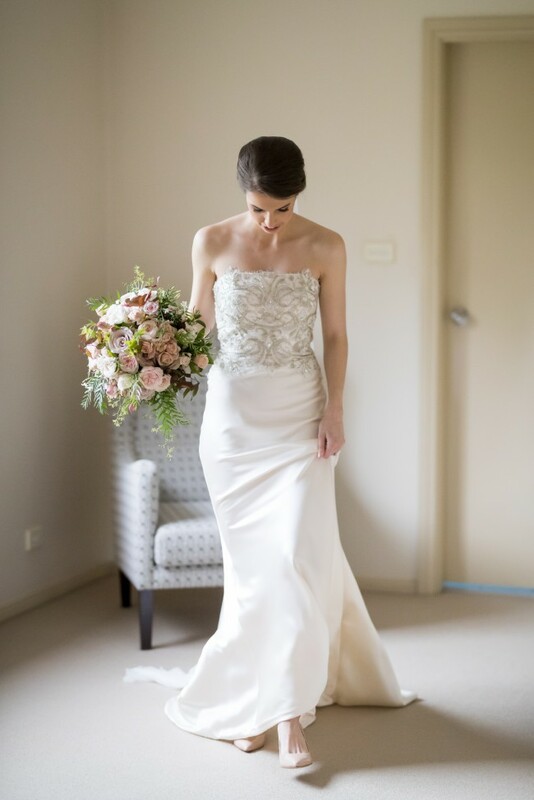 It is an absolutely beautiful dress which I adored wearing on my wedding day - it is far too beautiful to be worn once! The dress has been professionally dry-cleaned and is in mint condition. The dress cost me $6,000 and I am happy to negotiate around the $2,000 mark. Once you send a message, Maree can invite you to purchase the dress.